For user who is new to this, I'd always recommend to try the voice changer software program called AV VoizGame because it is quite simple and packed with features that good enough for the changing voice in online games and VoIP. The software program from AVSoft Corp. - Audio4fun.com now fully supports most editions of Windows: Xp, Vista, 7, 8 and on both 32-bit and 64-bit platform. So do not worry if your PC will be compatible with the program or not. It should just work well. However, please be noticed that the voice changer software still does not have any version for MAC. 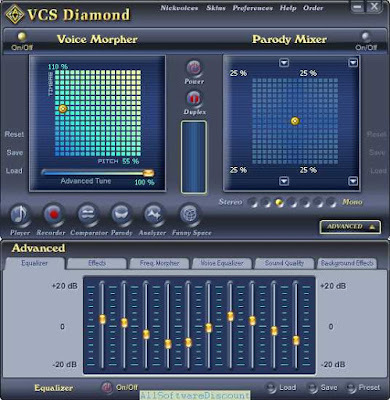 It's been years since the AVSoft Corp. released its very first version of voice changer software program (back to 2001), yet it unlikely to have big changes in the voice changing technique nor voice changing algorithm. Instead of that, the software tends to adapt very quick to the changes and trends of the Internet. So, rest assured that you will not be left behind after choosing the program for years later from now. The program therefore, requires only a normal headset to works properly. Using the software program on a laptop with its built-in microphone would also be fine. However, you may face the problem of echo and reverse when sound comes out from the laptop's speakers and then comes into the microphone again. So, make sure that you download the trial version of the program and test it on your computer to make sure that the program does work on your system. And, you may also need to contact the audio4fun's supporter for few technical questions before buying. 3. Using the AV VoizGame to change voice from male to female. 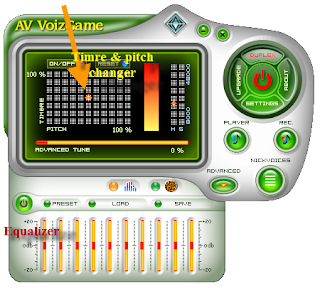 As I said from the beginning, the VoizGame is quite simple and easy to use. To change the voice from male to female, you just need to move Timbre & Pitch cursor from the center of the graph to the right. You may use the arrow keys from your keyboard to move it slowly . Because each people voice is characterized on pitch and timbre and others vocal things. So, moving the cursor to much to the right may make your voice sound weird and not natural. Unless you would want to create a character for cartoon or audio story. Try with this Pitch & Timbre graph first. And, if you need something more advanced, you may want to read the other posts via this blog.